Allies of Sri Lanka’s embattled president Maithripala Sirisena boycotted parliament Tuesday as the country drifted into a second month of political turmoil. Sirisena loyalists refused to show up at parliament in Colombo, where last week opposing MPs scuffled and threw objects across the chamber, forcing the legislature to adjourn. 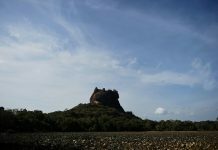 The island has been politically paralysed since October 26 when Sirisena sacked prime minister Ranil Wickremesinghe and replaced him with Mahinda Rajapakse. Parliament has twice voted against the former strongman president but he has refused to back down. Wickremesinghe, who holds a majority on the floor, has also not stepped aside. The speaker of parliament has not recognised either man — leaving the country adrift with rival factions claiming to command a government. Sirisena allies have accused the speaker of bias. “We will not attend parliament until the speaker agrees to act impartially,” said Nimal de Silva, an MP from Sirisena’s United People’s Freedom Alliance. Their opponents taunted the president, who has ruled out reimposing Wickremesinghe even as Sri Lanka remains locked in a power vacuum. “Usually you see opposition (parties) boycotting,” Eran Wickramaratne, a Wickremesinghe loyalists, told parliament Tuesday. The ousted prime minister’s United National Party plans to move a motion in parliament Friday to block any new spending by Sirisena’s administration. Sri Lanka risks entering 2019 without parliament having approved a budget for the year. Moody’s recently downgraded Sri Lanka’s credit rating amid warnings the island could default on its considerable foreign debt.